As the hive queens have stopped producing larvae earlier than usual, “which produce a sugar-spit that adult wasps rely on,” a plethora of wasps is now on the hunt for sugary food at the height of summer. 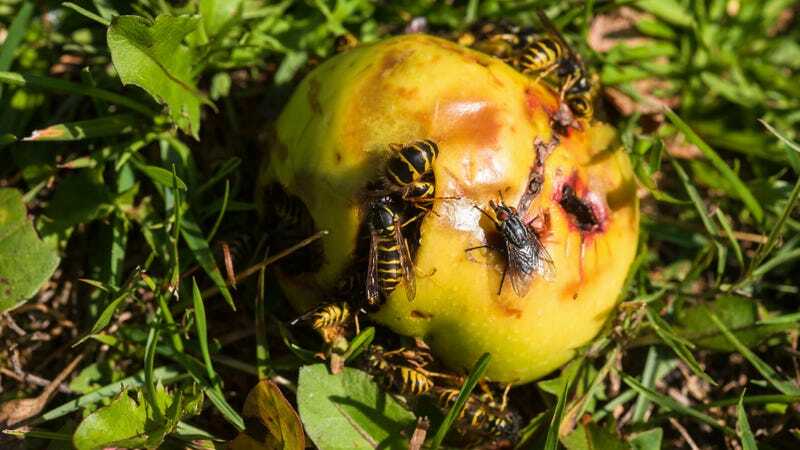 As they find rotting, fermented fruit, or even almost-empty glasses of cider and beer at outdoor pubs, the wasps are getting drunk, which just makes them angrier and more likely to sting. Just like us when we’re drunk. We’d much prefer it if the wasps fought amongst themselves, like any bunch of drunken bros at the tavern. But a pack of drunk angry wasps ready to sting sounds straight-up terrifying.